The book ‘Omri has an animal in his belly’ is a children’s book and work guide for parents and carers to familiarize themselves with the animal each of us has in our bellies. The book aims to assist young children to deal with their feelings, their inner voices, and reinforce their ability to listen to our happiness, worries and fears without judgment, while reinforcing the self image. As mentioned in Proverbs “Heaviness in the heart of man maketh it stoop: but a good word maketh it glad.“ 1 The book provides tools for discussion of feelings of anger, fear and confusion, inner talk and talk with friends or parents. 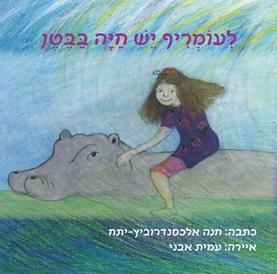 The book ‘Omri has an animal in his belly’ also develops the value of ‘love your neighbor as yourself’ and the concept that others too often feel confused or angry, and there is a way to reach peace and understanding. At the end of the book there are suggestions for parents for family discussions with the book – with material and color, drama, sound and conversation. This stems from the belief, that the family, and the special moments or reading the book are a special time enabling talk and processing of important issues. The book describes a whole world view emphasizing primarily the respect for the child, in happiness and difficult moments. It aims to open a window to discover the inner secrets of the child and finally lead him to connect to his actual experience, and a more harmonious life with himself and the world. The book is suitable for kindergarten and primary school children. It is intended to parents, people dealing in therapy and consulting, and all children loving people, for whom the child’s soul is important. The writer, Hanna Alexandrovitz-Ytah is a social worker using in her therapeutic work techniques based on mindfulness. The artist, AmitAvni is an artist, spiritual healer, dealing with guided imagination and healing, art therapist, and works with troubled children.